Our weather forecast appears to be very similar to last week's report for much of the state. In general, it looks like a cool Friday followed by some warm and sunny weekend days. Early next week the reports suggest we are going to get another cold front with a good chance of precipitation west of the Front Range. For rivers and streams, this should bring in some good fishing and active, feeding fish. Streamers should be something to exploit especially on the cloudy days it looks like we will be getting Monday - Wednesday. Blue winged olives will also be a little more prevalent on the cloudy days so be on the lookout for their hatches. I know we have mentioned this in previous reports but if you have been thinking about making an alpine lake fishing trip, this could be one of the last weekends of the year to get some good action especially for topwater bugs. Depending on the fish species, the lake fishing should also pick up in general for spinning and bait anglers. Fish are going to be moving around more for spawning activities, stocking up for the winter, or just becoming more active as they feel more comfortable with the cooler water temperatures. Bass will start to become a little more lethargic but that does not mean that you cannot bring in some decent catches. Educate yourselves on some late season tactics as fall can be a great opportunity to expand on your techniques and produce some of the best fishing days of the year. Be safe, best of luck, and most importantly, take some pictures to show off your success! As of 9/28/2018, the trout fishing is excellent just like last report! Anglers are landing some really decent sized fish now and most of the action is being reported later in the day. The water has cooled down enough at night that the fish are in feeding mode to start preparing for the winter. The same Daredevils and ACME Kasmasters are catching some monster trout. Drift casting and trolling from boats has produced well but shore anglers are also getting good catches when covering a little water. Pike fishing has also picked up some and is reported as decent and should only get better with each passing day. Gitzits in brown or pumpkin colors are bringing in good sized trout as well as a few pike here and there. For the pike specifically, trout and perch pattern rubber or plastic swim baits are still bringing in the bigger fish as well as spinner baits. The pike are starting to show up more in the shallows where the water is a bit warmer so cover good real estate by casting parallel to shore where your lure will spend more time in the strike zones. Kokanee fishing is poor and nothing new to report. As of 9/28/2018, the fishing at Spinney has improved much like Eleven Mile as we approach fall. The last report showed Spinney being a bit inconsistent but that hump appears to be ending as the fish are being less finicky and more focused on fattening up before winter. Also, note the browns are preparing to spawn so they will be more aggressive. As the browns get more active and aggressive for their spawn, this is a good time to break out some trout pattern lures, tube jigs or streamers. Anything that could agitate a territorial or cranky brown could yield some big catches and hard fighters! A successful, unconventional method for fly fishing in lakes especially during windy days is using a green or brown bead headed wooly bugger in a size #4-6 trailed by a chironomid. Tie about 20 inches of 4 x fluorocarbon to your leader and attach your wooly bugger, this will allow it to sink quicker. Trail the wooly bugger with about 2 and a half feet of 4 or 5 x fluorocarbon to your chironomid #14-18. The wooly bugger will often attract a curious trout and the trailing midge or nymph will actually get the fish to take the bite. This tactic gets the flies deeper and is easier to cast in the wind than a lighter rig. Try using a slow and steady retrieval. As of 9/28/2018, fishing is starting to pick up some especially for the smallmouth bass. The cooler temperatures are encouraging them to move around a lot more and into the shallower waters. This gives the shore anglers a better chance as you can now start casting more parallel along the shore to cover more strike friendly territory. Using Ned rigs with pumpkin or watermelon colored plastics are reporting some good success. During the full moon period, many anglers were reporting some good walleye catches as they moved to shallower water to hunt for shad. Now the walleye are starting to move back into the deeper water. Boaters have marked them suspended 25-35 feet over almost 80 feet of water. Jigging and slabbing from boats has brought some in. The walleye will eventually come in closer to shore but as of now, they are still hovering over the deep water. .
As of 9/14/2018, the lake is at 703 surface acres with a surface elevation of 6,182.30 feet. Surface water temperatures are around 68 degrees. Shore anglers are catching trout and many other species of fish on homemade dough bait, PowerBait in the green colors, and worms all along the south shore. The river at Reilly Canyon has slowed down to a trickle while heavy willows and other vegetation has emerged around the lake. The most action for fish is occurring in the early mornings and late evenings. Some catfish are being reported around the inlet which is now off color due to the recent rains up stream. Boaters have done well targeting walleye while smallmouth are being caught early in the morning and late evening. Trout are being caught during all hours. Worm harnesses and crank baits have worked well for many species of fish when fishing in deeper water, around 15 feet or more. As of 9/28/2018, the surface water temperature is around 66 degrees and about 60 percent full. Fishing, in general, has been picking up for most species especially wipers. Anglers who have been fishing at night have been having success with shad imitations in the 10 to 20 feet depth range. The recent full moon helped spark the feeding of the wipers but they could still be chasing the baitfish in the later hours of the day these next couple of weeks. Walleye have been fairly slow. Much like Chatfield and Cherry Creek, the shad population at Pueblo Reservoir was very high this year so the walleye have had a very plentiful food source making it tough for angling. If you can locate the shad movement patterns, you will be able to find the feeding walleye. Focus on reactionary bites, use shad imitations that have a lot of action. The catfish bite has been more or less average. A few anglers have reported some good catches along the west end fishing area with the typical catfish bait rigs. As of 7/23/2018 due to a low water year throughout the state and the Arkansas River drainage water levels are dropping and the fishing has been tougher. Walleye fishing is slow with water temperatures in the mid 70's. Fishing for white bass and wiper can be good if anglers are able to figure out where the bait that these fish are feeding on is located. Crappie fishing has also slowed drastically as the water temperatures have forced the fish into deeper water. 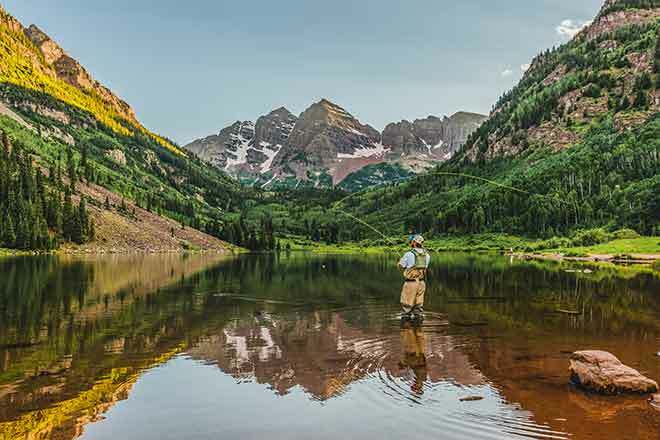 As of 9/28/2018, fishing is getting better and better for the Pikes Peak reservoirs as their closures near. The terrestrials are still apparent but their days are numbered as we reach cooler nights and the possibility for freezes increase. Lake trout are starting to come up from the depths in search of food to fatten up for the winter. Try using a Rapala's Countdown to explore different depths until you start to find how deep the trout are holding. Decent sized spoons and Kastmasters are also good lures to try when testing different depths when locating fish. If you can get out on a belly boat or canoe, you can cover some good water and search where the trout are hiding and how deep while also doing some mid water casting for rainbows. This 762-acre impoundment is located off of E. Quincy Avenue, two miles east of E-470. As of 9/28/2018, the conditions have not changed much lately. Anticipate fishing to pick up the closer we get to October as fall fishing can sometimes be some of the best of the year! Trout fishing from shore is slow to fair. Some trout are being caught from the Dam and in the Marina cove using PowerBait. Boaters reporting fair to good conditions on trout, trolling with crawlers and lures. Perch action is slow to fair from boats using jigs. Walleye action is currently slow to fair with a handful of reports of walleye being caught using bottom bouncers and jigs. Restricted to electric motors only. For more information call 303-326-8425. Park hours September 6:00am-8:00pm. This 881-acre impoundment is located in Cherry Creek State Park, in Aurora. There are two entrances to the park, the east entrance off S. Dayton St. and the west entrance off S. Parker Rd. As of 9/28/2018, many anglers are finding it tough to bring in the walleye right now. This is mainly due to the seasonal effects that are happening on the water, in particular, the shad. Guides recommend changing your summer tactics and gear more towards the fall as the shad are now behaving differently and so are the walleye. Instead of looking for the larger schools of walleye, search for transition points from deeper to ledges of shallower water. Basically what is happening is the shad are coming over these points to get to the shallow waters as the walleye wait in ambush. There may be fewer numbers of walleye in these areas but you will find hungrier fish. Jig raps, spoons, and blades in shad imitations will be the ticket. These fish will trigger off of faster moving bait fish so using reactionary techniques will get their attention best. Take advantage of the windy days by going to wind-blown shorelines. The shad will be more concentrated and schooled together there and will attract good numbers of hungry walleye. As of 9/28/2018, the bass fishing is rated as slow to fair. Try fishing chatter baits just outside the weed lines in 10-15 feet of water. All other species slow or no reports. Park Hours for September 6:00am-8:00pm. Restricted to artificial flies and lures only. Electric motors only and hand launched watercraft only. Trailers and vehicles prohibited in the water. For more information call 303-326-8424. This 1,356 impoundment is located in Chatfield State Park. As of 9/28/2018, the walleye are spread out at the moment and fairly deep in at least 20-30 feet of water. The walleye are hunting the shad as the baitfish are moving around more recently due to the drop in temperatures. Smallmouth bite is really good right now, especially around the dam face. Swimbaits and rattle raps are getting good numbers of smallmouths. Trying some deeper running crankbaits or rattle raps around points could also temp some walleye that are on the prowl for shad retreating from the deeper waters. As of 8/7/2018 pike and trout are being caught throughout the lake. Bass fishing has been good near the Cedar Campground as well as near the dam. Keep in mind that there are a couple of fishing regulations that are specific to Rifle Gap: Walleye - Bag/possession limit= 1 fish Size= Must be 18 inches or greater All other species are same as the statewide regulations. As of 9/28/2018, the late summer and early fall fishing are on at the reservoir! Many anglers are having luck and limiting out on rainbow trout at the Inlet, lot 14 through 16, Keystone Cove, and Morrison Cove. Successful anglers are primarily reporting good catches while using PowerBait, PowerGrubs, nightcrawlers, mealworms, spoons, jigs, and crankbaits. The tailwater fishing is good right now. The cooler temperatures and decent flows are allowing the fish to feel comfortable as they start to stock up for the winter months. Fish have been reported rising for blue winged olive hatches and biting on various emergers like the Barr's and U.V. emergers. Streamers are also producing nice fish in particular leach patterns.